Mix the eggs, milk, Irish cream, sugar, vanilla and the salt together in a Temp-tations bowl. Blend well, making sure the sugar is melted. Add the cubed bread to the bowl and mix well with a spoon. Let stand for 30 minutes, turning the mixture over every 5 minutes. Lightly spray your Temp-tations Crock with food spray. Add the soaked bread to the crock. Bake in preheated oven for 35-45 minutes, or until lightly browned and a toothpick inserted into the center of the bread pudding comes out clean. 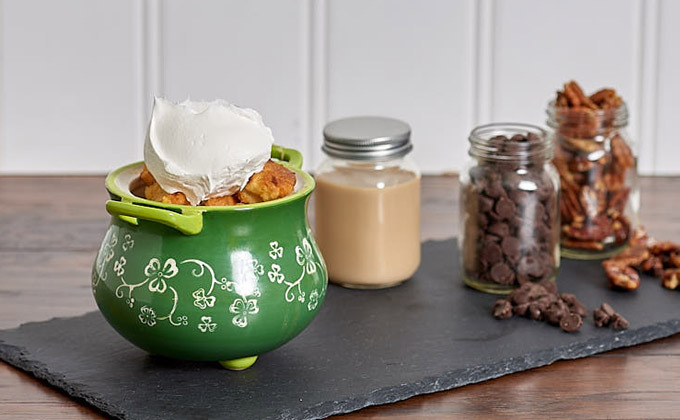 You can serve with vanilla cream or whipped cream.